We routinely receive questions from church administrators, asking what type of credit card they should get for church expenses and/or how to accept parish-member donations made with plastic. Both are great questions, as you might not consider religious groups and other nonprofit organizations to be businesses, yet they can’t be qualified as consumers either. In other words, it’s fair to wonder whether such groups should opt for a business credit card or a general-consumer credit card. In addition, while credit card payment processing has become far more accessible in recent years, guidance is still required to pick a service that increases donation levels rather than costs. First of all, it does not matter – from a credit card standpoint – if the organization you represent is a church, another type of nonprofit, or a for-profit business. The credit card options at your disposal will not change. While you might assume those options are limited to cards branded for business use, that’s not necessarily the case. Business credit cards are more similar to general-consumer cards than you’d think, as issuers evaluate the primary applicant’s personal credit standing when making business credit card approval decisions, hold that person individually liable for account balances, and report usage information to their personal credit reports. That’s why the primary applicant will need to provide his or her Social Security Number (SSN) in addition to the church’s Federal Tax ID Number (also known as its Employer ID Number), and certain other personal information when applying for a business credit card. Business credit cards provide unique expense tracking features and offer more lucrative rewards on things like office supplies and telecommunications services, but general-consumer credit cards offer better user protections. The CARD Act only applies to general-consumer cards, and among the implications of that is the fact that issuers are restricted from increasing interest rates on existing balances unless the user is 60 days delinquent on payment. They can raise rates at any time with business cards, which means you cannot achieve debt stability when using one. Authorized users are another point of differentiation for business credit cards and non-business credit cards. You can add far more authorized users with a business account as well as establish customized spending limits with each one. While you should be able to give one or two individuals access to a personal account, you’ll have far less flexibility. They need to give account access to a number of authorized users and wish to set customized spending limits for each of them. They plan to use their card for everyday purchases and expense tracking purposes. You are looking for a way to finance big-ticket purchases. Like any other business, you will need to have a policy in place for use of the church’s credit card accounts by staff members. This will enable you to set parameters regarding who qualifies for a church credit card, how the card may be used (i.e. for what expenses), and the responsibilities of each cardholder. Your policy should include rules requiring the review of each monthly statement by the cardholders’ superior to verify that the cardholder has not misused the card. It should also address what is considered adequate documentation for charges to the card and the timeline for when those receipts must be submitted. You can have all staff members with access to the account sign the terms and conditions of this policy before issuing them a credit card. There should also be guidelines for disciplinary action should a cardholder breach the terms of your credit card policy. Having clear guidelines in place will ensure that misuse and abuse of the card stays to a minimum. These guidelines should include penalties for misuse of the card, including cancellation of the credit card for that cardholder or other disciplinary action. Some churches do things like require a person to surrender the card for three months after the first offense and may require corrective action or termination of employment for further offenses. If your search for church credit card information derives from an interest in enabling parishioners to contribute via plastic, you can take solace in knowing there are myriad payment processing options, from companies that would love to have you a customer, that you can choose from. But before we get into to the specifics of choosing a payment processor and introducing credit card donations to the congregation, it’s important to note why credit card processing can be beneficial to a church. There are tangible benefits for your congregation as well – namely, habitual simplicity and rewards. Besides, plastic-based donations, like all electronic spending, are simply more palatable for cost-conscious parishioners. It has to do with something called the “temporal construal theory” in social psychology. This is where the controversy comes in. Should churches be in the business of encouraging the buy-it-now, pay-for-it-later mentality that has plagued our economy in recent years? The risks of credit card use should be a concern for anyone who considers putting plastic in their wallet or enabling electronic payments for their organization. But religious organizations in particular should consider the addition of a credit card donation program to be a teaching opportunity, if anything. Financial illiteracy is a big issue in this country, and there are innumerable parallels between religious values and the principles of responsible money management. The best course of action is to do a bit of preliminary research in order to find the simplest option possible. Cost should take a backseat to ease of use at this juncture because you want to test the process before committing to it permanently. So, once you find the right service, introduce it to your congregation on a trial basis. If, after 3-6 months, donations ultimately rise above the added cost of providing credit card processing, then you can begin building out the infrastructure and minimizing costs. If they don’t, you should probably just scrap the credit card idea because the returns won’t be worth the added cost. Once you've determined that offering the ability to donate via credit card will lead to increased giving, your focus should turn to maximizing profit margins. In other words, compare the processing fees (i.e. swipe fees) that different service providers charge, and select the option that meets both your logistical needs and budget. After you settle on a processor, you can permanently introduce credit card donation capabilities to your congregation. Setting up a “Giving Kiosk” that enables people to ask questions and directly make electronic donations is a great way to spread awareness. 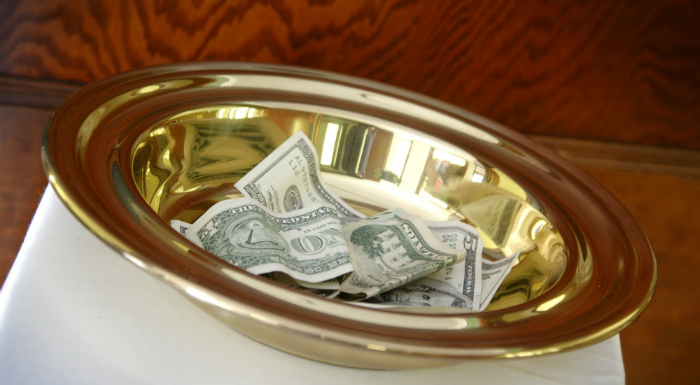 In addition, you may want to consider offering “Automatic Tithing.” This allows church members to fill out a form in church or online in order to provide their credit card billing information, specify the amount they want to give to the church, and establish the frequency of their contributions. “Online donative giving has proven to be quite effective for lots of small donations to large, well-established nonprofits (like the Red Cross) for large-scale disasters (like the Haitian earthquake),” says Melissa Stone, the Gross Family Professor of Nonprofit Management in the University of Minnesota's Humphrey School of Public Affairs. Finally, you can also begin to test how applying a surcharge to credit card donations will affect giving. The law enables merchants to charge customers more for credit cards vs. debit cards, and incentivizing debit card use can be wise if your congregation is likely to have both forms of payment in their wallets. Recent regulations have made debit card purchases cheaper to process, which means you will get a bigger cut of a debit card donation than a credit card donation. Accepting credit card donations may help increase giving rates, but in order to truly maximize fundraising efforts, a nonprofit organization must also adjust its underlying philanthropic approach and the way in which it frames giving to the consumer. But with that said, a nonprofit must be careful about simply asking for more money. People tend to give more when they are self-motivated, as opposed to being explicitly told to fork over their hard-earned cash. Schervish recommends establishing an emotional connection between potential givers and the people – not organizations – they will be helping with their donations by leveraging the donor’s own experiences and ideals and allowing them to designate their giving for specific uses. At the end of the day, you simply have to remember that “donors pledge to an organization because they affiliate with their charitable mission and activities,” according to Dwight V. Denison, professor of public and nonprofit finance at the University of Kentucky. Truly doing good and clearly conveying how donations will further your charitable objectives are therefore always going to be the best ways to fundamentally improve fundraising efforts. If you are interested in getting a credit card for church spending purposes, business credit cards and personal credit cards are both options. The decision rests on whether or not you plan to finance any significant purchases as well as your authorized user needs. If you are interested in accepting donations via credit card, you should try it out on a trial basis to gauge how giving habits change with the added payment option. If donations increase, compare service providers in search of the lowest interchange fees and consider charging more for credit card donations in order to promote giving via debit card (it’s cheaper). If donations either decrease or are unchanged, then it might be best to stick with your current system. PREVIOUS ARTICLEAsk The Experts: Are Stock Market Glitches Something to Worry About?NEXT ARTICLE Can a Credit Card Company Sue You? This, this is a helpful overview.